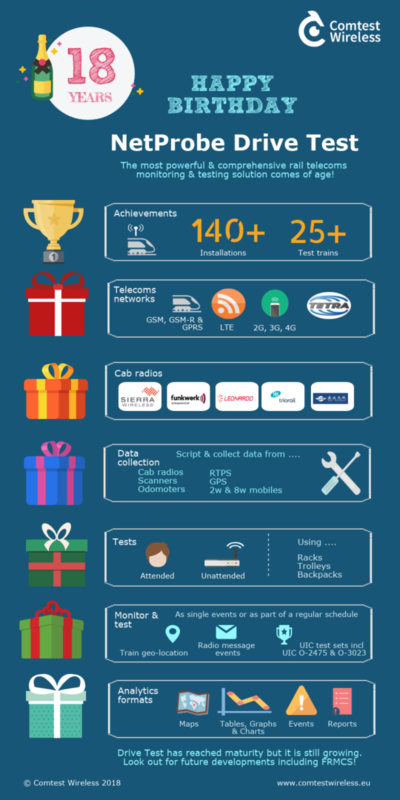 Comtest Wireless, independent experts in the field of GSM-R and ERTMS test and monitoring solutions, announce that with NetProbe Drive Test’s 18th anniversary, it has reached the ‘age of maturity’. When NetProbe Drive Test first launched in 2000, the aim was for it to become the market-leading solution to actively test and measure rail telecoms quality of service. Eighteen years later, with over 140 installations and more than 25 test-trains in-use, it’s fair to say that NetProbe Drive Test has certainly achieved this aim and ‘reached the age of maturity’. “1. Active testing gives rail telecoms engineers the opportunity to collect data on rail telecoms performance and quality of service. This important process can help in many ways: for instance, gaining acceptance for a new line, or as part of regular maintenance on operational lines. 3. Because it’s a vendor independent solution, NetProbe Drive Test customers can collect data from a wide range of devices: different 8W cab radios (including: Sierra Wireless, Funkwerk, Triorail, Leonardo and SED Wireless), scanners, RTPS (remote train positioning systems), train’s odometry, and 2W modem/handsets (2, 3, 4G). 4. The system is available in various HW configurations: from highly portable and battery operated, to permanent installations in rack cabinets. We can also provide systems hosted on trolleys and backpacks. All configurations are currently supported/improved, including custom versions. 5. NetProbe Drive Test natively embeds graphical scripting functionalities, which enables both operators who are not so skilled in IT and those who are, to automate the operations. It is now also possible to automate the entire test system and control it from your office. Now there is no need to send engineers to attend the test, which saves time and money. 6. The final key benefit for customers is that NetProbe Drive Test is backed by NetProbe Analytics, the powerful, proprietary Comtest Wireless software platform. This means that active GSM-R monitoring data can be viewed and reported in maps, tables, events, charts, graphs and layers – including multiple windows open and synchronised at the same time. Organisations requiring further information on NetProbe Drive Test or any Comtest Wireless GSM-R and ERTMS test and monitoring solutions, should contact us.